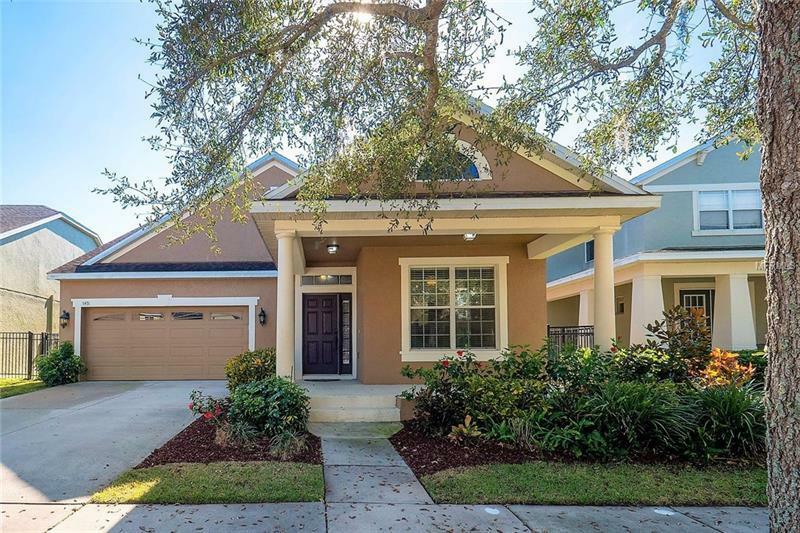 Large and lovely 4 bedroom, 2.5 bath Windermere home with TESLA solar panels and âpower-wallâ battery backup -meaning virtually NO electric bills some months. And wait until you see the HUGE fenced-in grassy backyard (.25 acre lot). The neo-traditional style and charm of this abode will impress as soon as you step up to the covered front porch. Walking into the home youâll notice the large neutral tile running throughout the living spaces and wood laminate flooring in the bedrooms âno carpeting at all. Formal living and dining room at front of home flow into the updated kitchen with breakfast bar/island, KraftMaid solid cabinets with soft close drawers and granite counter tops. Laundry room and half bath are off the kitchen too. The whole family can enjoy this large open plan concept with casual dining space opening to the family room with French doors leading to the back covered lanai. With a 3-way split bedroom plan, everyone has privacy. Quiet and spacious master suite includes oversized walk-in closet (7âx9â) and master bath with soaking tub, separate shower and granite topped vanity. Off the family room are 2 more bedrooms with full bath in the hallway and upstairs youâll find the super large fourth bedroom (18âx25â) or flex space/game room. Summerport has many activity spots to offer âlarge community pool, neighborhood parks, fitness center in clubhouse and tennis and basketball courts too. Zoned for sought after schools: Keeneâs Crossing Elem, Bridgewater Middle and Windermere High.